Spring cleaning time is here, and chores may include sweeping out garages, basements, sheds, cottages and cabins. Keep in mind that these environments may contain rodent droppings, which can present a rare but deadly health risk from hantavirus. Hantavirus was first recognized in North America in May, 1993 in The Four Corners area of Arizona, New Mexico, Colorado and Utah. The first case probably occurred in Utah in 1959. It has since been found in other states and other countries. According to the Centers for Disease Control & Prevention (CDC) website, people become infected with hantaviruses through contact with infected rodents, their urine or their droppings. 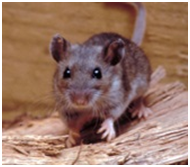 To date, CDC has identified Deer Mice, Cotton Rats, Rice Rats and White-footed Mice as hantavirus carriers. Descriptions of these rodents and maps showing their distribution throughout North America are available on the CDC website. Hantavirus Pulmonary Syndrome (HPS) is a rare but deadly disease caused by hantavirus infection. One in three reported cases of HPS has been fatal, according to a CDC “Minute of Health” podcast. Healthy people can contract HPS. Infection may occur when rodent feces or urine- and saliva-contaminated dust and dirt are stirred up, by sweeping or vacuuming, for example, and inhaled. Hantavirus also may be transmitted through hand-to-mouth or hand-to-nose transmission after a person touches a surface contaminated with hantavirus. It can be transmitted to people through rodent bites or broken skin. CDC reports there is no evidence to date that hantavirus can be transmitted from person to person. Using regular bleach: Add 1.5 cups of regular bleach (5.25% sodium hypochlorite) to 1 gallon of water. Repair screens and holes in cracks and walls to help keep rodents out. Keep areas clean and free of open food. Use traps or consult an exterminator to control rodent infestations. Air out closed buildings for one hour before cleaning them. Wear disposable gloves and a respiratory mask to avoid contact with potentially contaminated substances. Disinfect and then clean up rodent nests, trapped or dead rodents and rodent droppings: To disinfect, spray the affected area with bleach solution and allow to soak for 5 minutes. Use a paper towel to pick up waste and dispose of it. Place refuse from cleanup in two trash bags, sealing them tightly. After rodent droppings and urine have been removed, disinfect items that may have contacted rodents and their wastes. Finally, remove gloves and wash hands thoroughly with soap and water. Does Exposure to Bleach Cause or Help Prevent Childhood Infections?